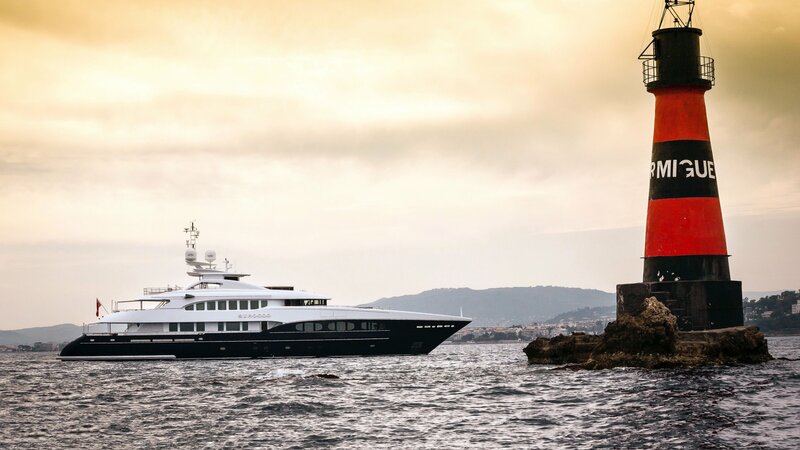 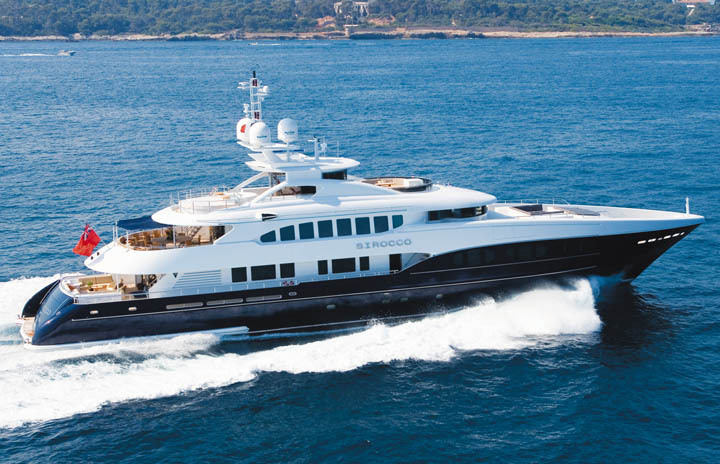 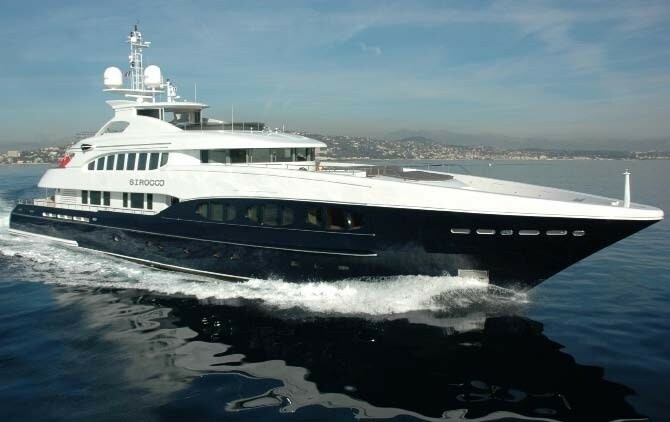 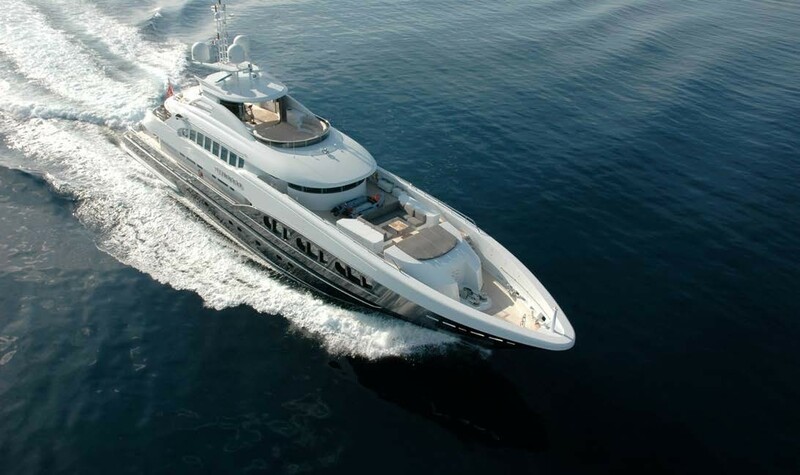 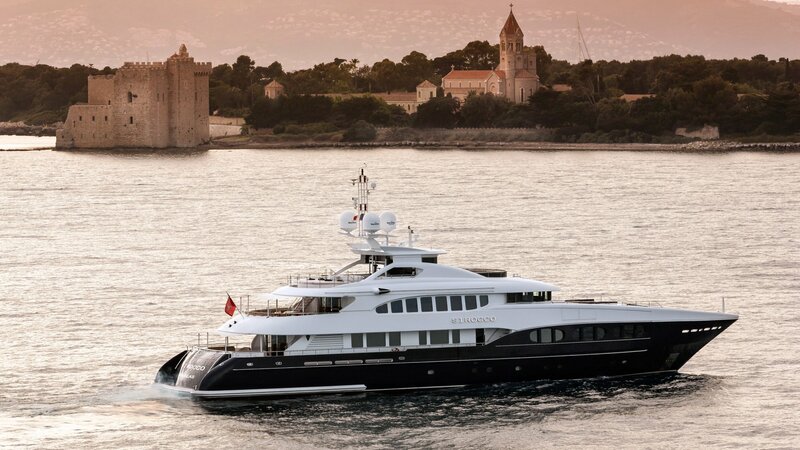 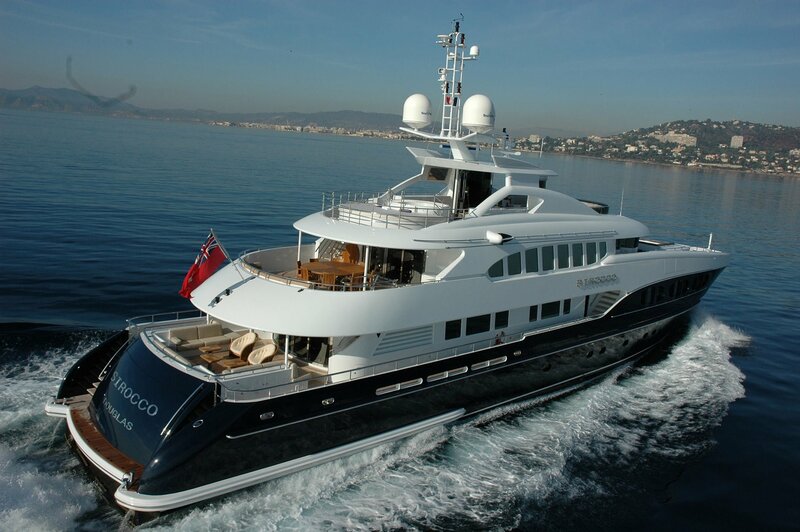 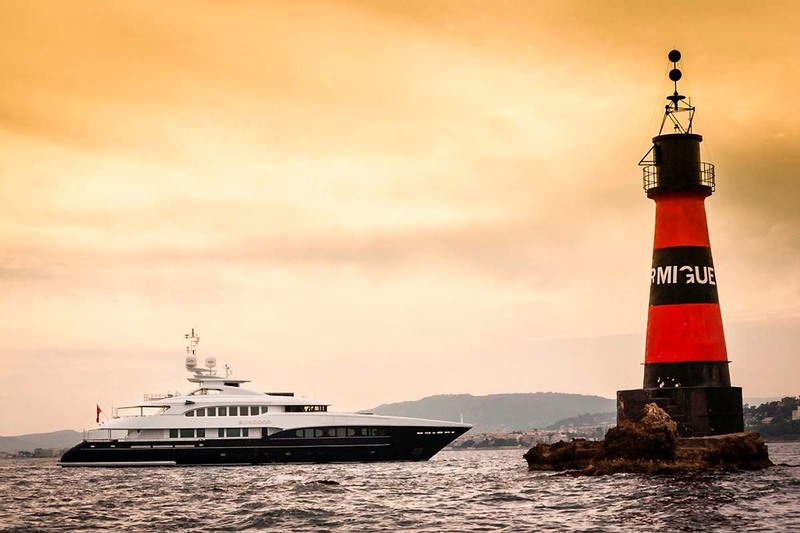 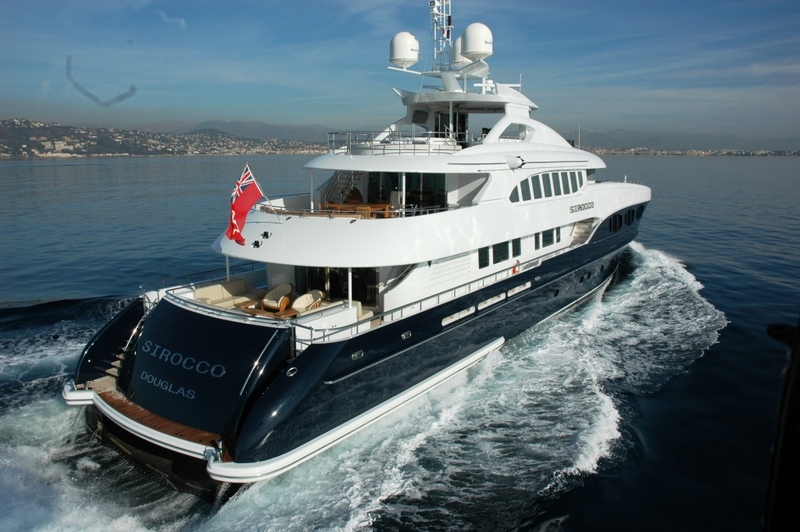 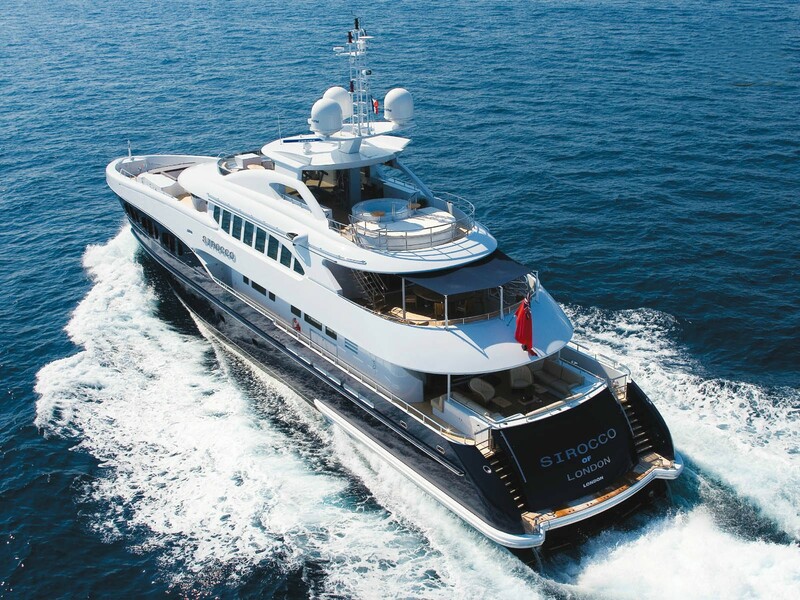 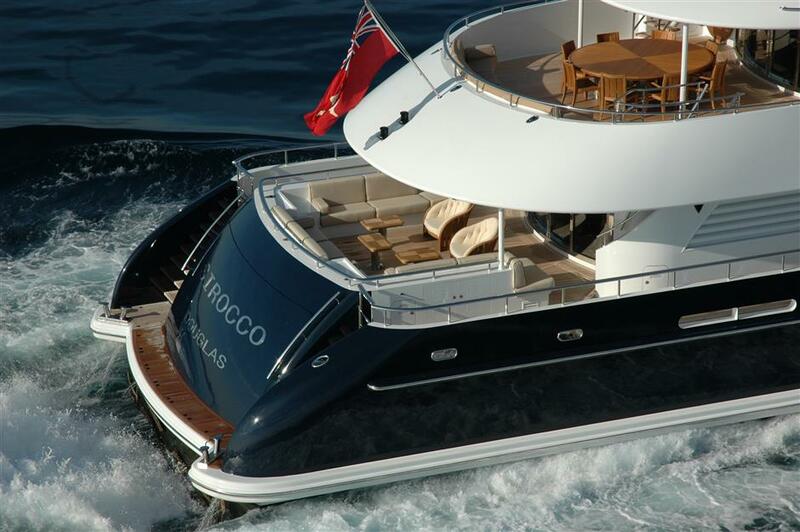 Luxury superyacht SIROCCO was launched by well renowned Heesen shipyard in 2006 and measures 47m (154ft). 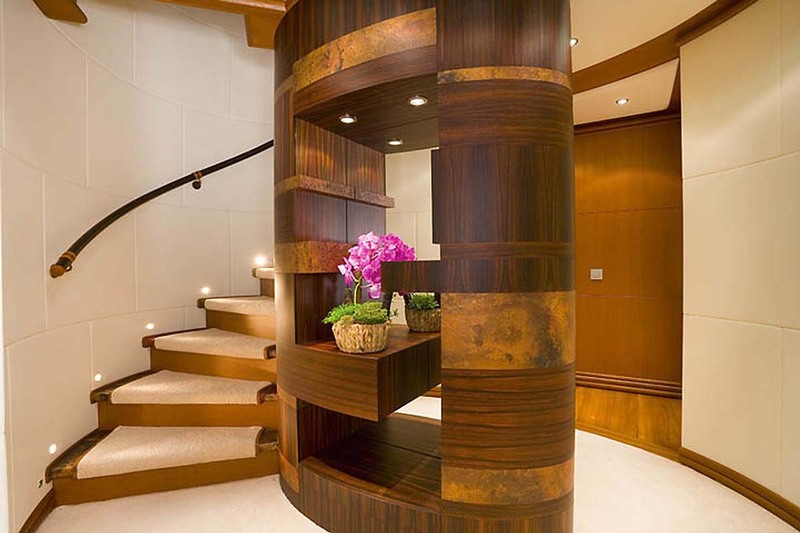 Her interior design is a work of famous Omega Architects. 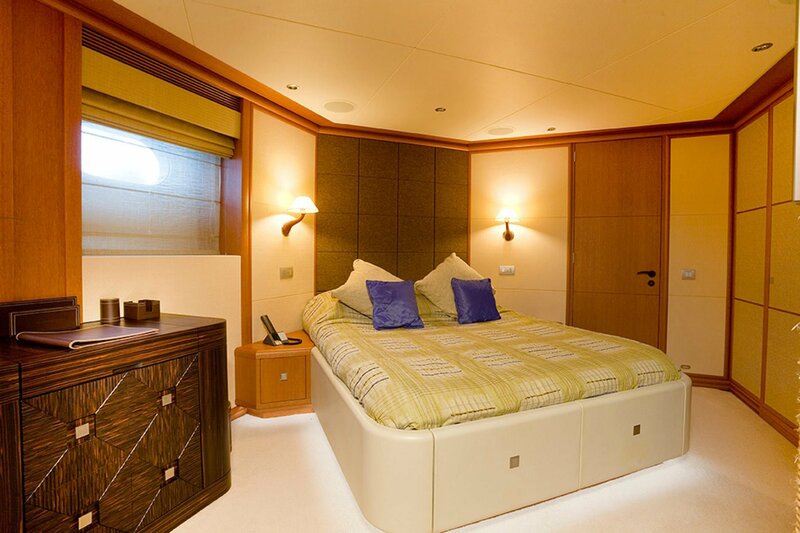 She is available for up to 12 guests in 6 cabins. 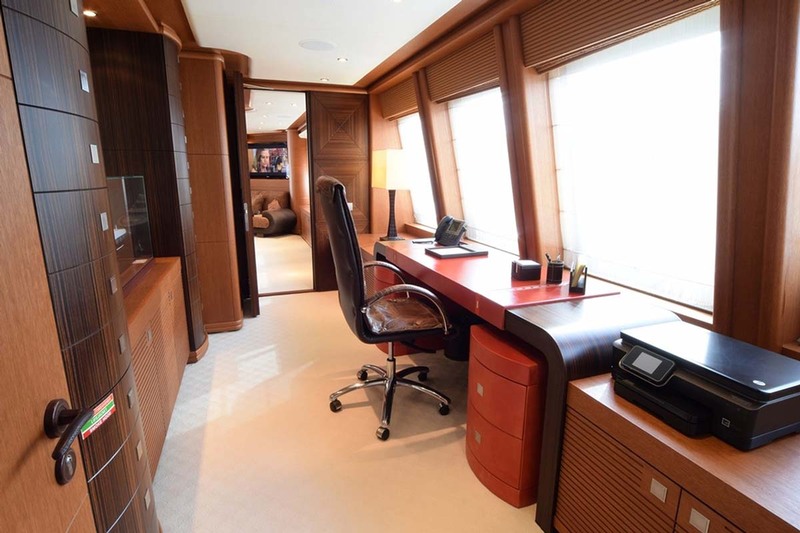 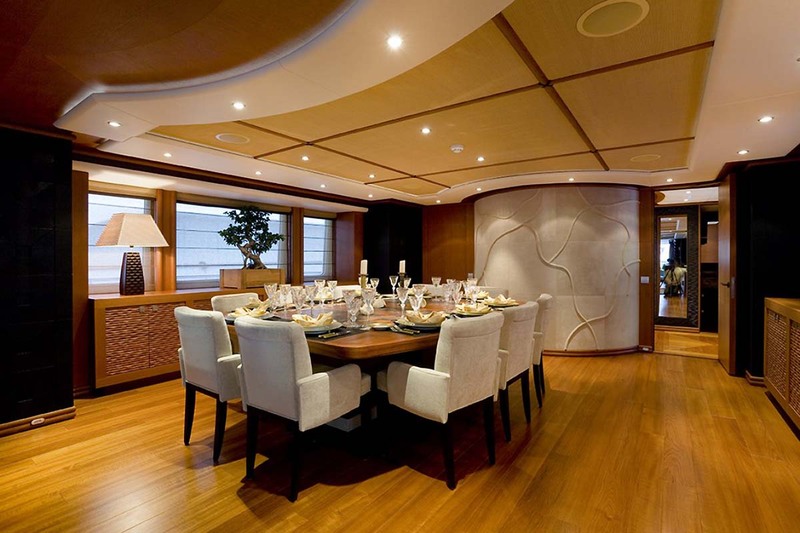 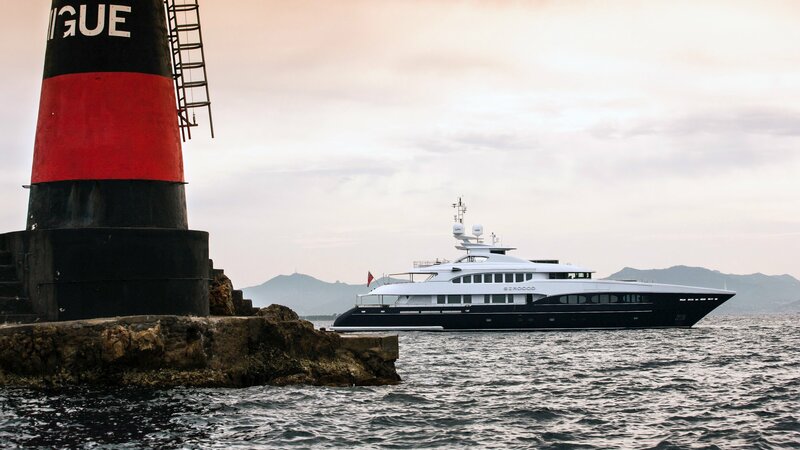 Motor yacht SIROCCO offers a refined interior by Omega Architects, featuring a stately ambiance in neutral tones, much of the décor boasts an Indonesian feel, with fine leathers, bespoke furnishings and intricate wood detailing. 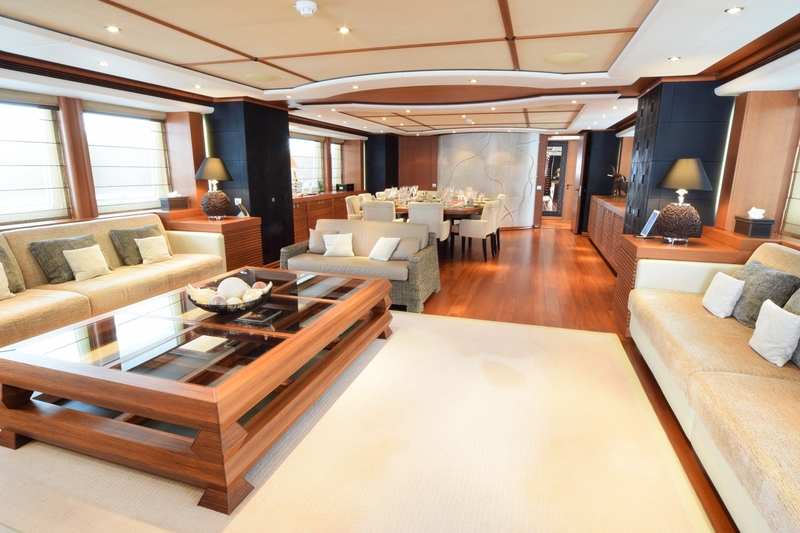 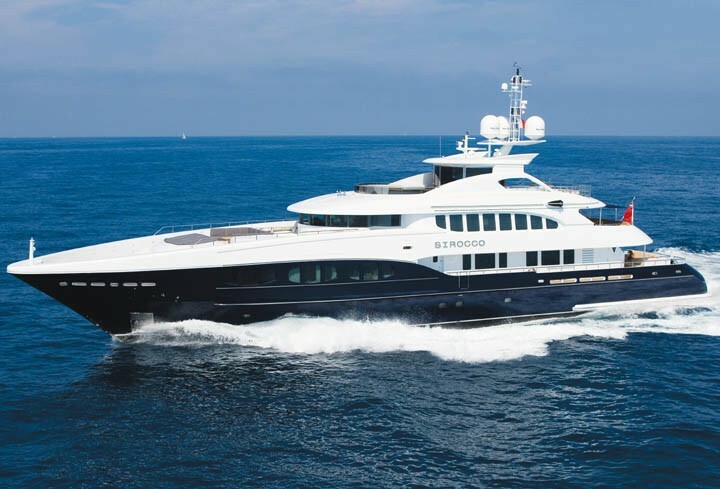 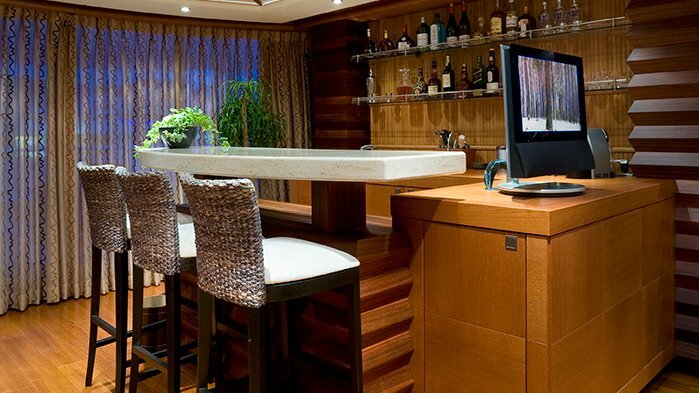 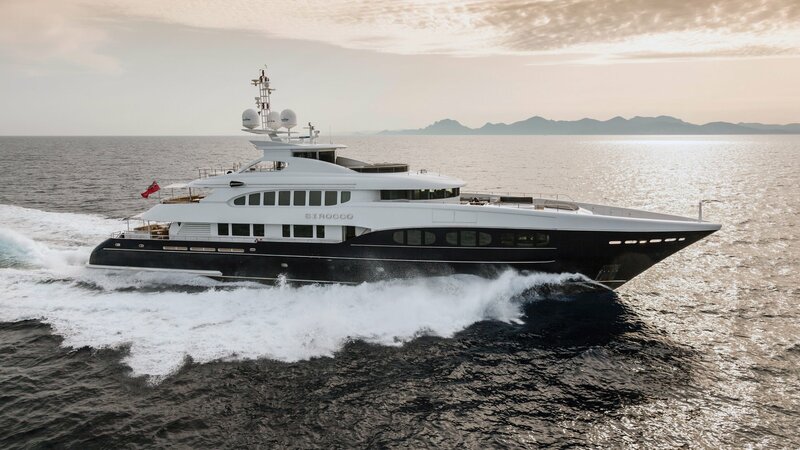 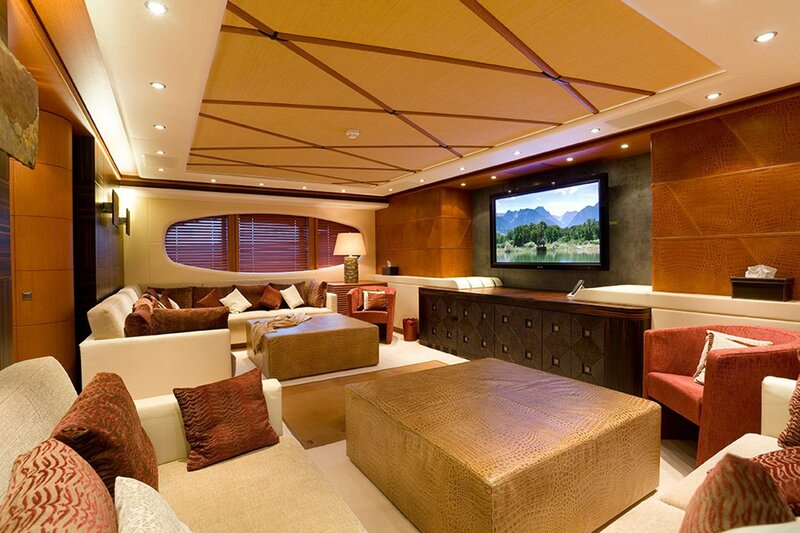 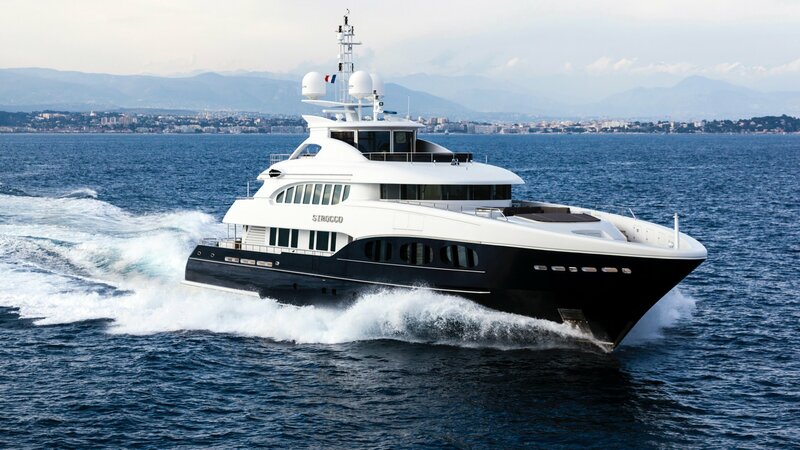 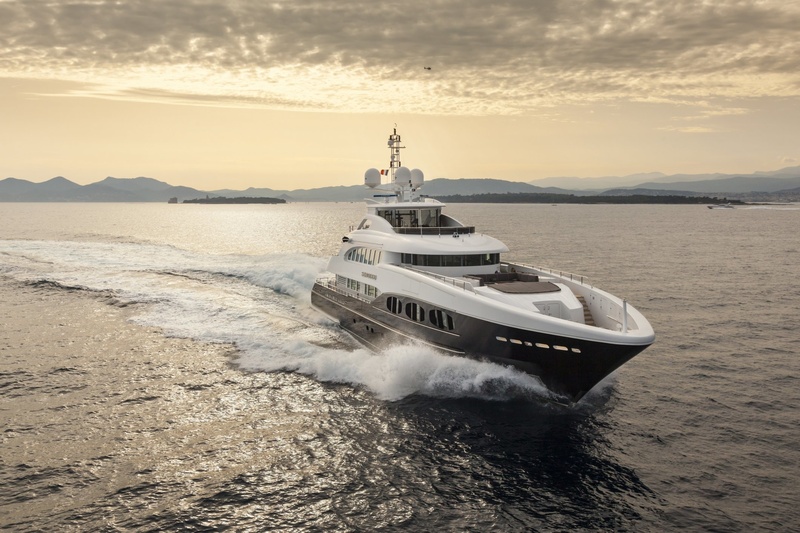 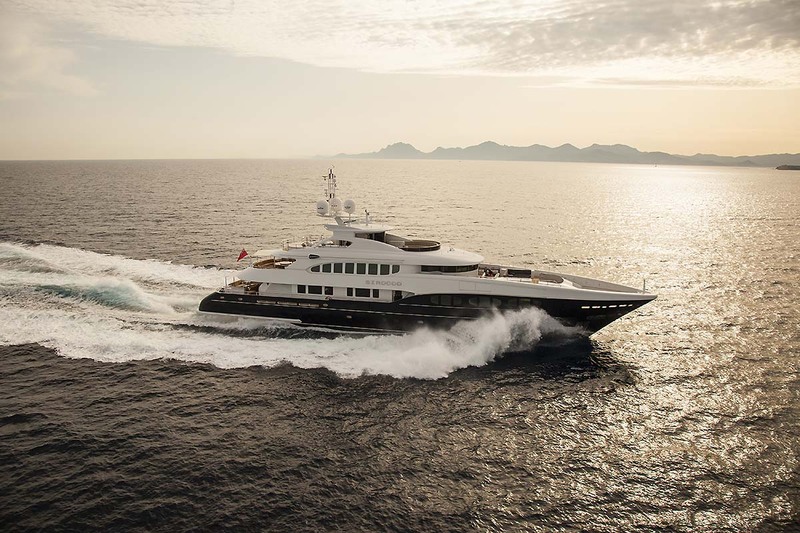 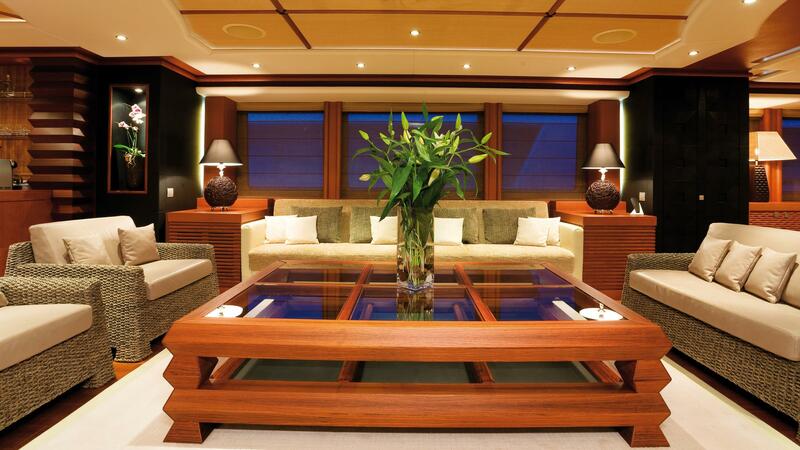 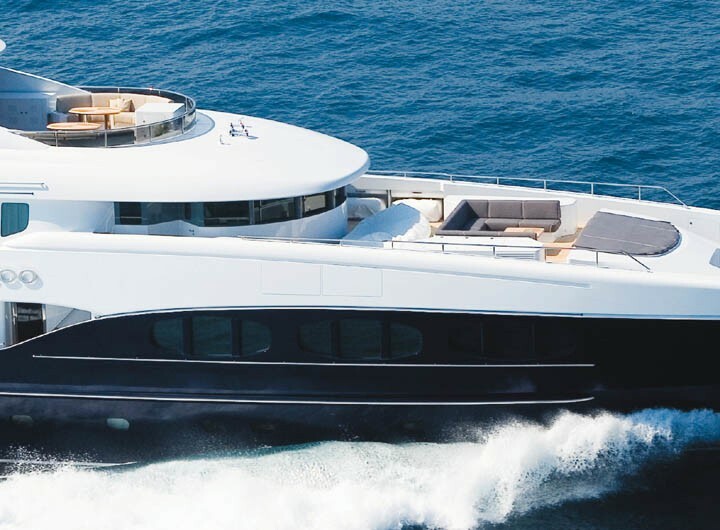 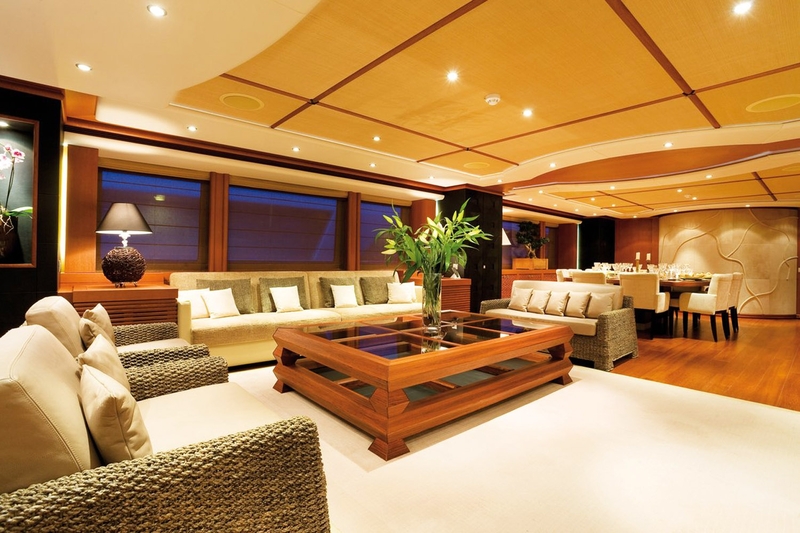 The main deck aboard the has a marble-topped wet bar upon entering the aft sliding doors, further forward the generous full beam salon space offers four ample sofas and a large glass topped coffee table. 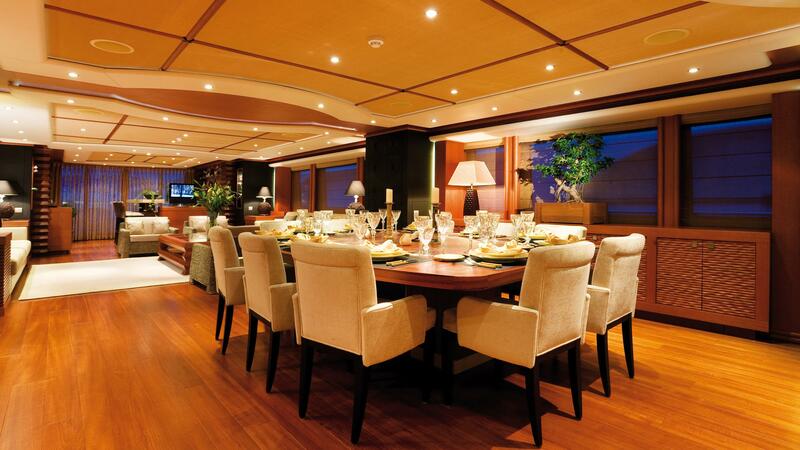 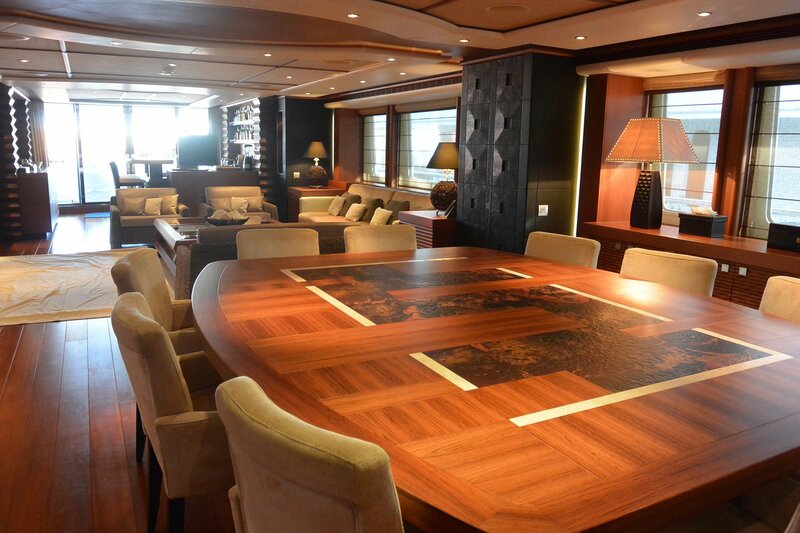 Amidships and forward of the salon, the formal dining space seats all 12 guests in supreme comfort and style. 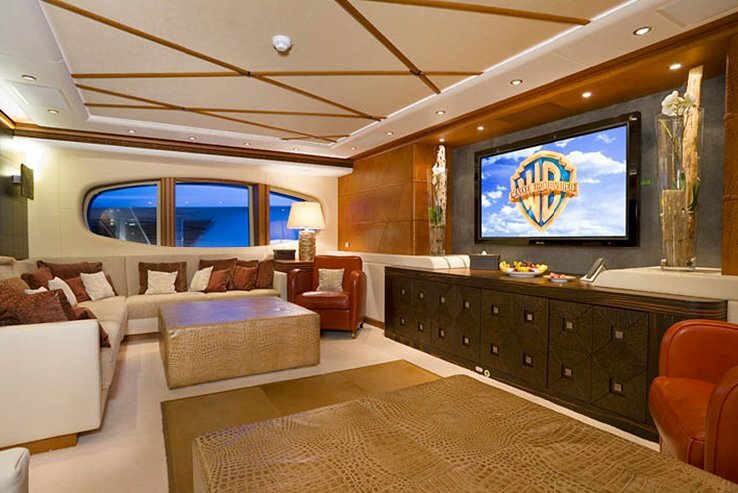 Guests wishing for indoor entertainment will enjoy the full beam forward home cinema with ample seating and massive flat-screen TV. 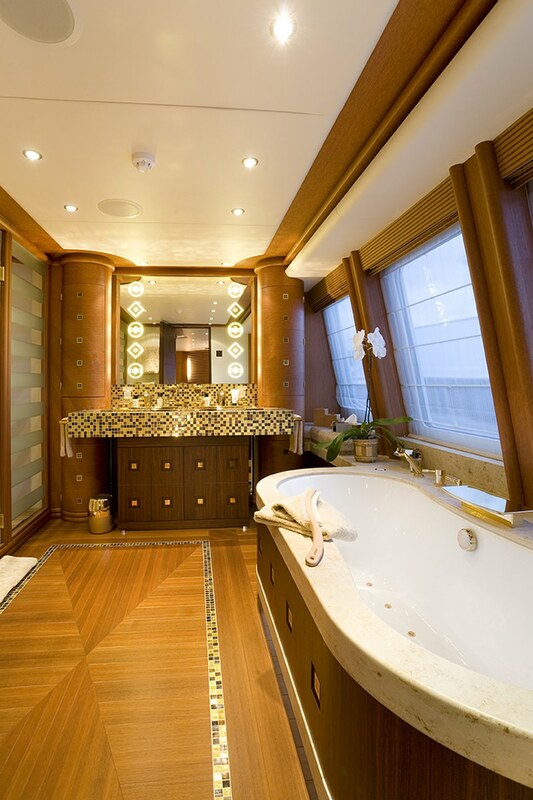 Above the main deck, the upper deck offers a full beam master suite with center lined king size bed, 2 love seats and en-suite with marble tub and unique mosaic tiling. 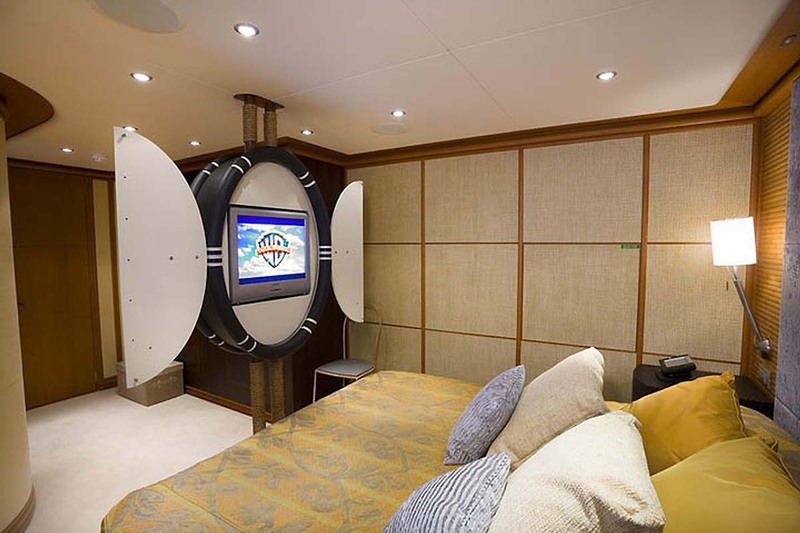 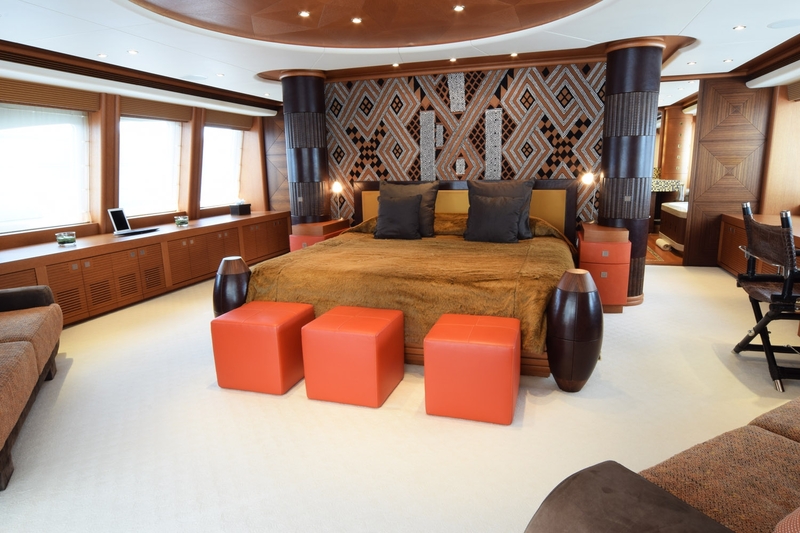 The master suite also enjoys access to the aft upper deck, complete with a circular teak dining table, plenty of additional seating and partial shade. 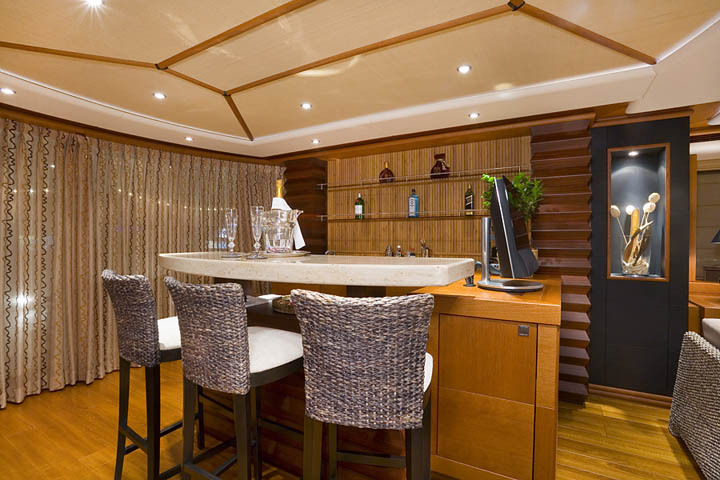 The exterior living is generous on the yacht, and the aft deck is ideal for entertaining with cocktails and canapés, offering ample lounge seating, tables and direct access the indoor wet bar. 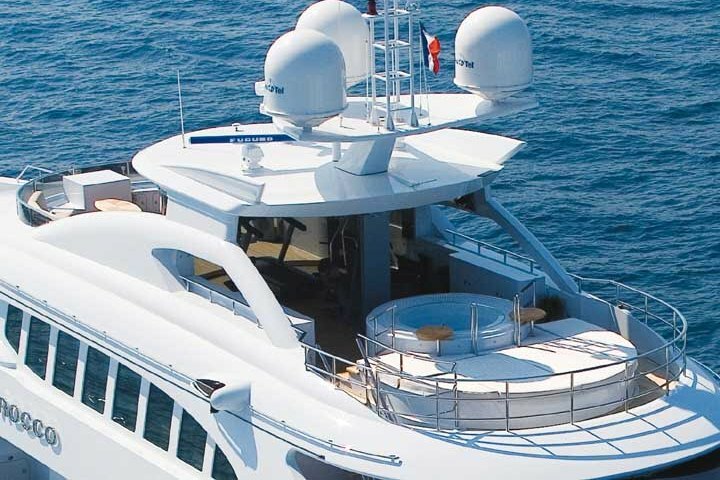 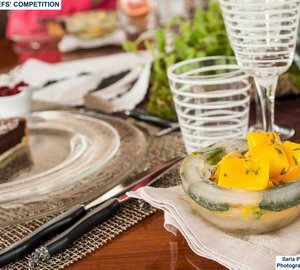 The upper deck offers an alfresco dining option, in an intimate and social atmosphere aft, while forward, a further alfresco dining option and large sunpad are accessed from the lower side decks. 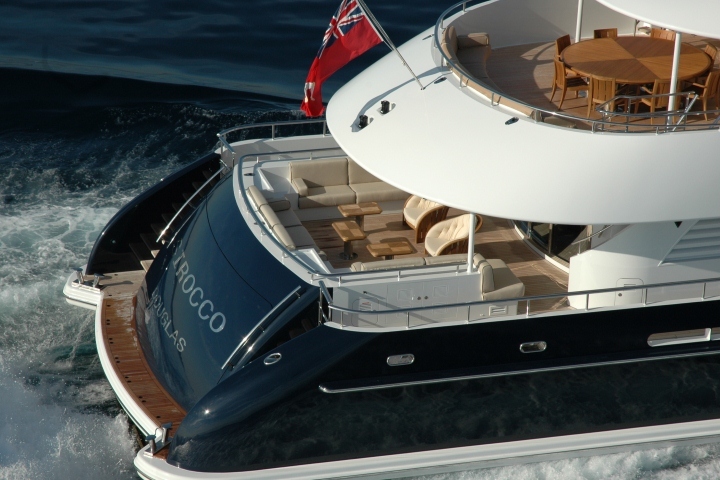 The sundeck aboard the tri-deck design SIROCCO features a generous semicircular sunpad, wrapped around the deluxe Spa Pool tub. 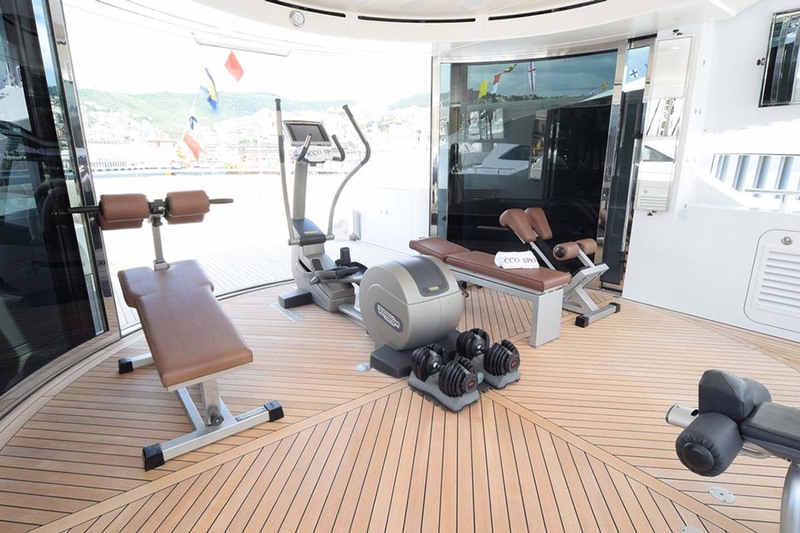 A shaded gym offers guests work out with idyllic views. 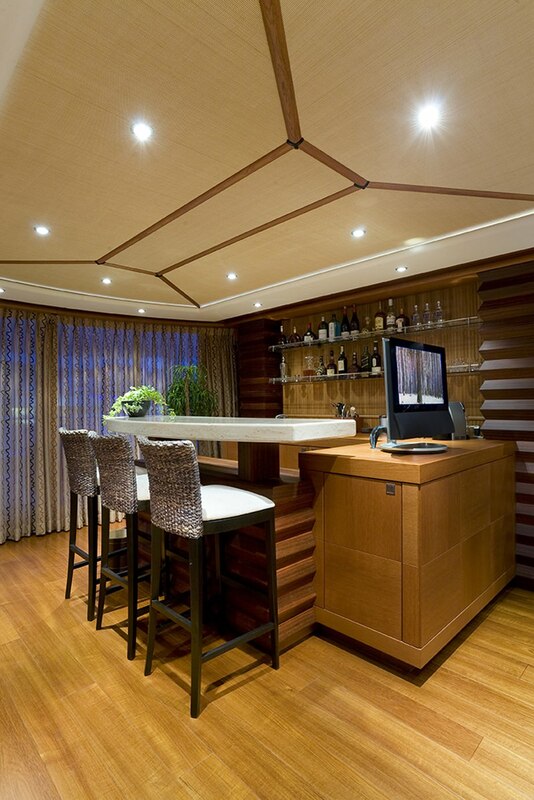 Forward on the sundeck, lounge seating and cocktail tables are ideal for any time of the day or night. 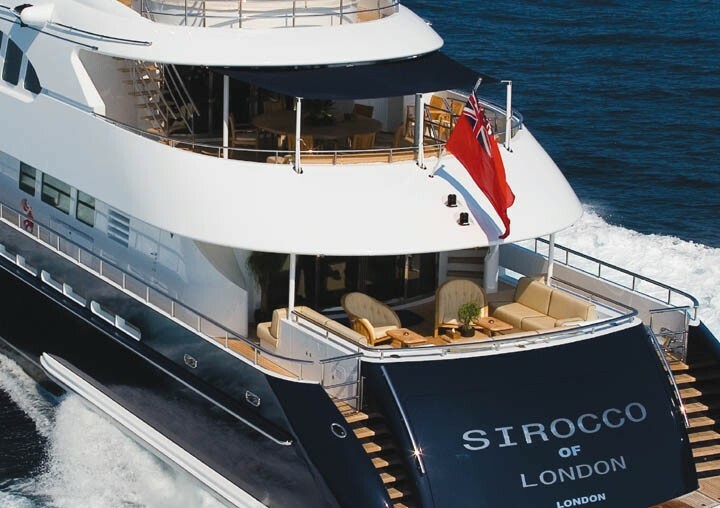 Superyacht SIROCCO has a beam of 8.5m (27.10ft) and a draft of 2.5m (8.2ft), she is powered by 2 MTU 3700HP engines capable of 20 – 26 knots. 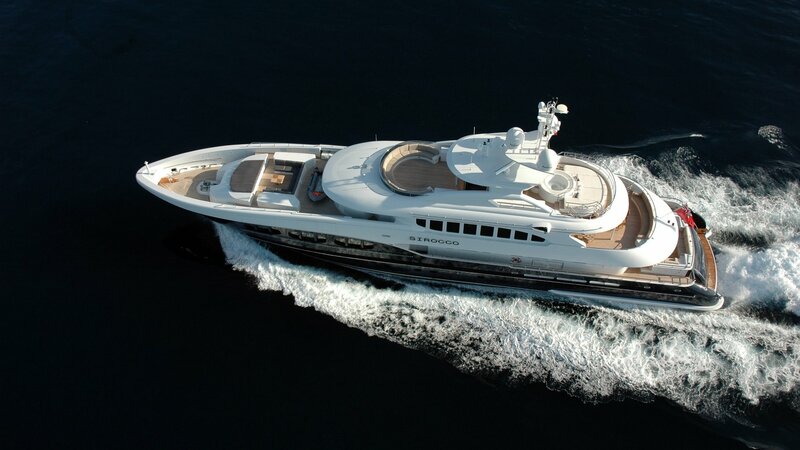 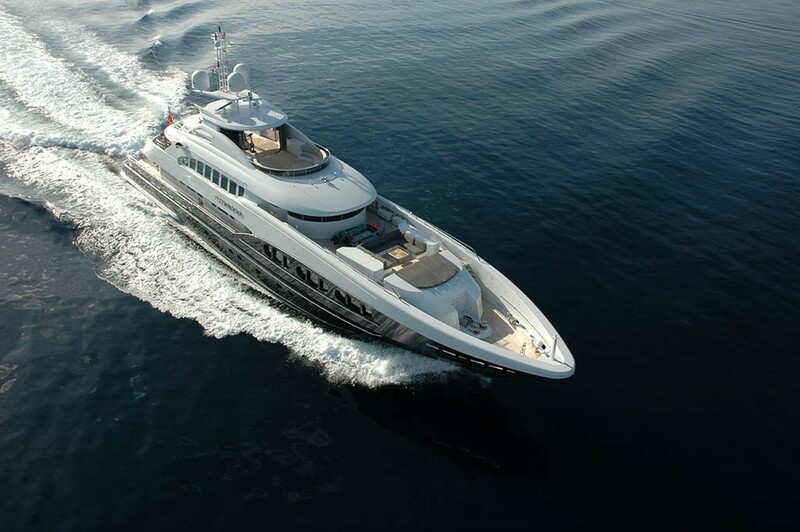 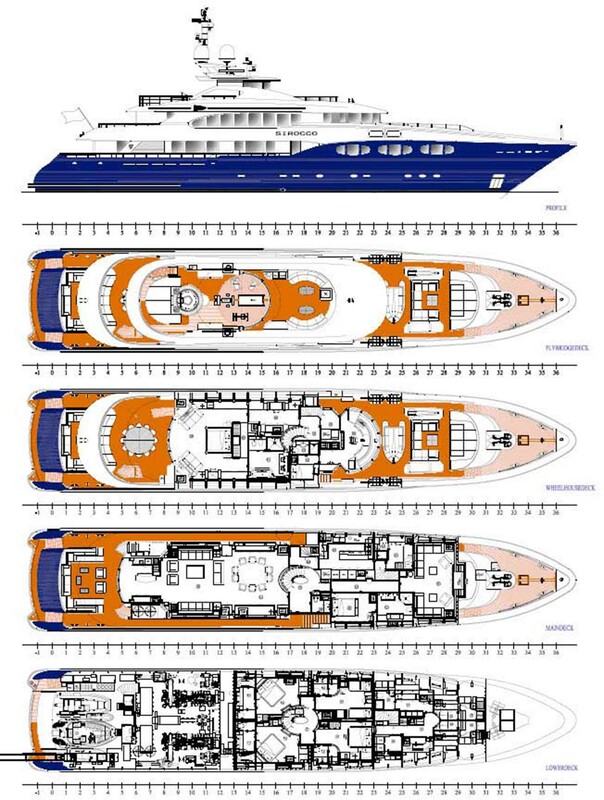 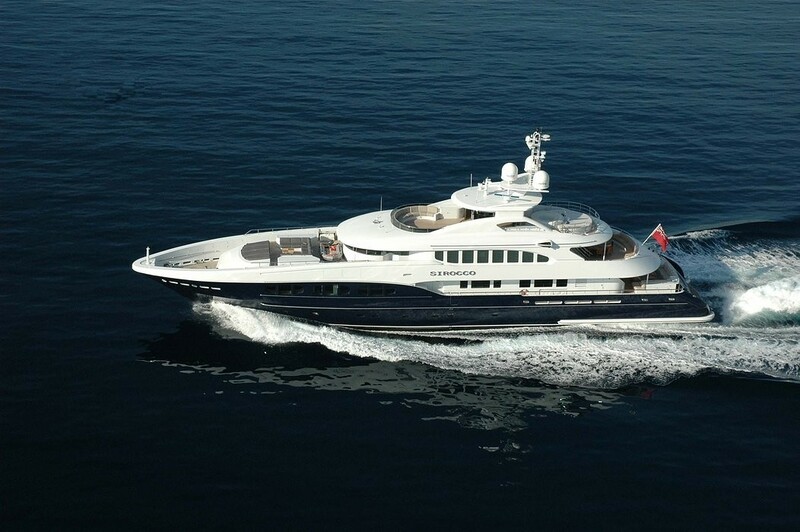 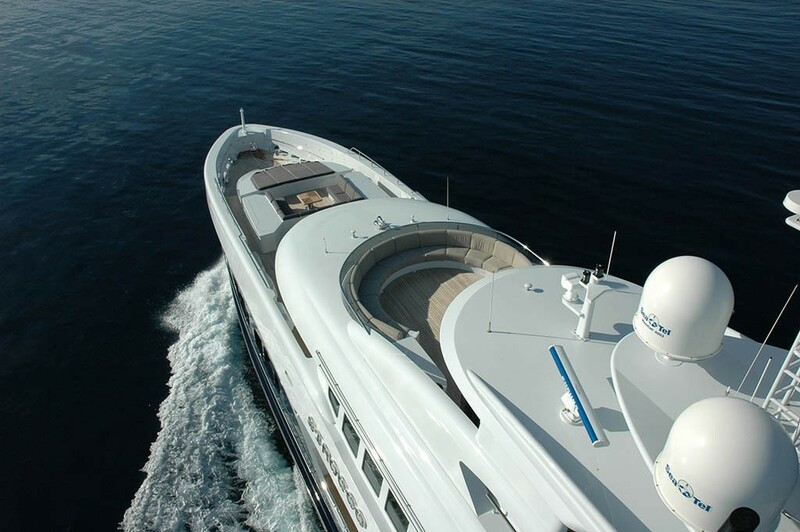 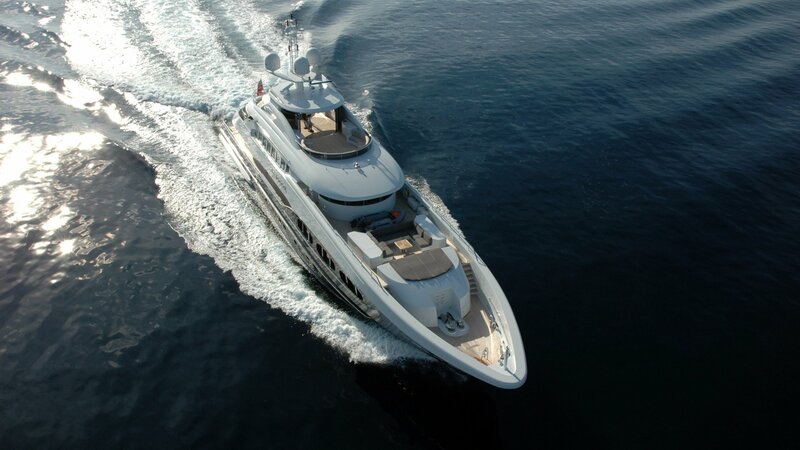 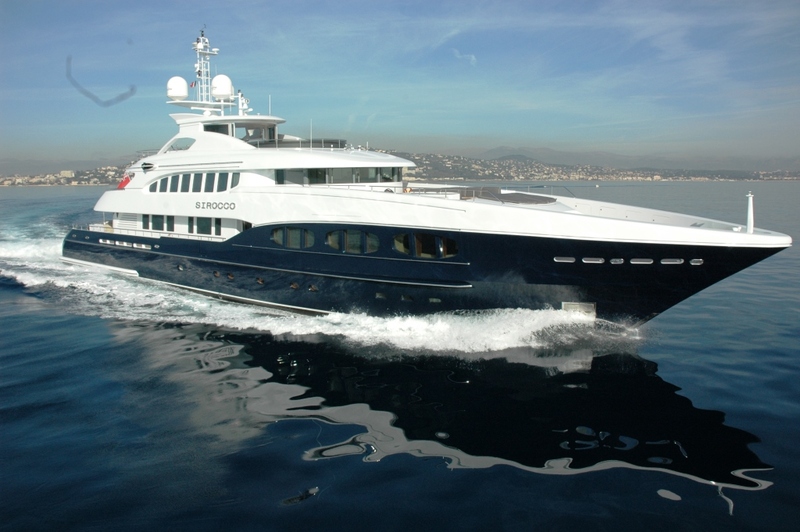 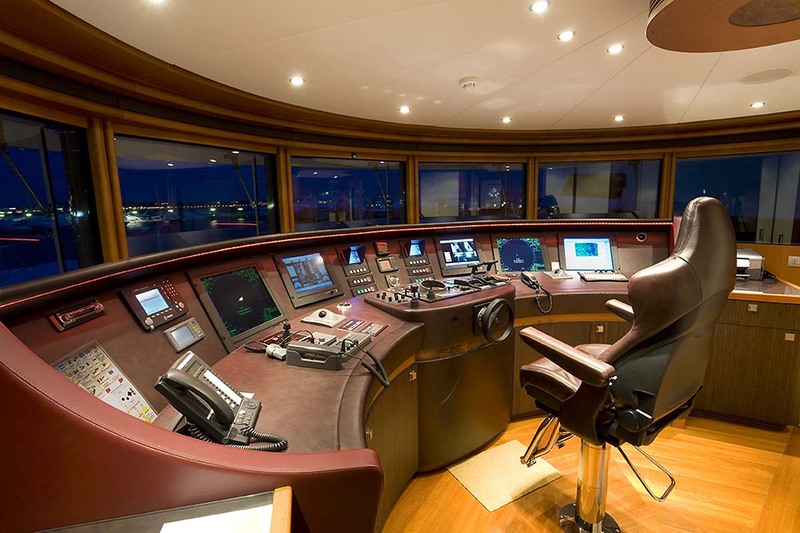 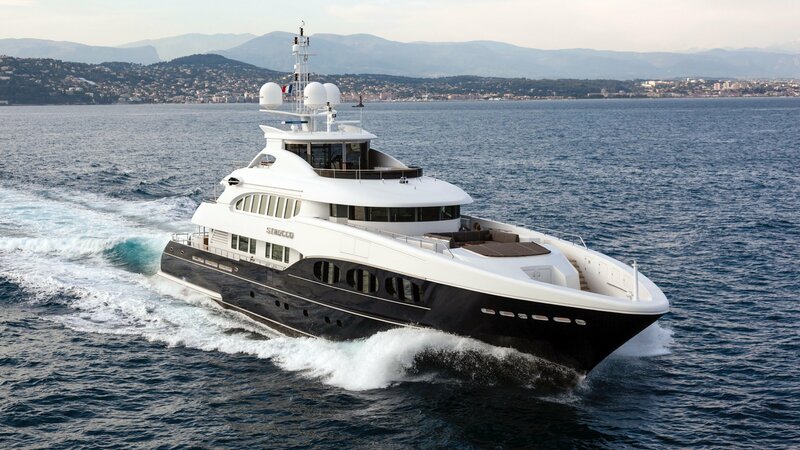 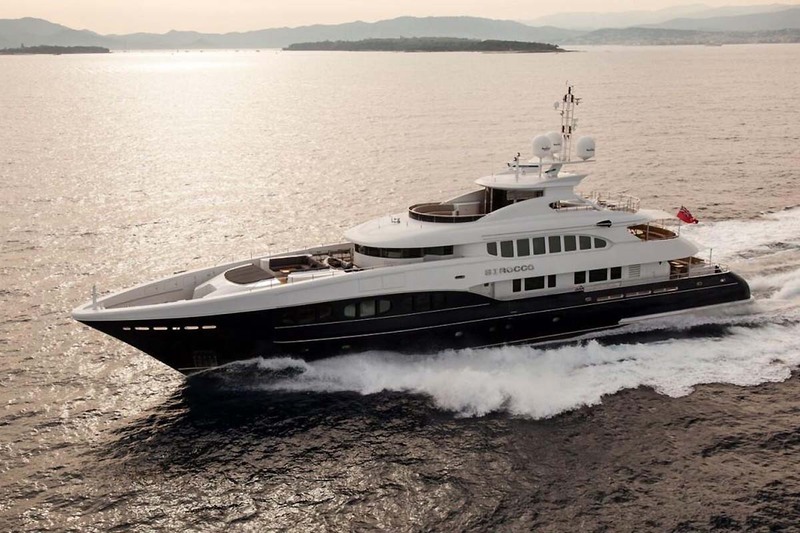 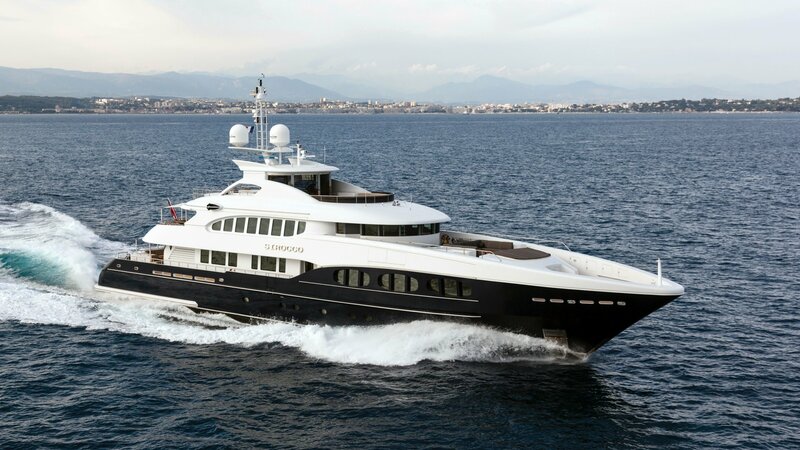 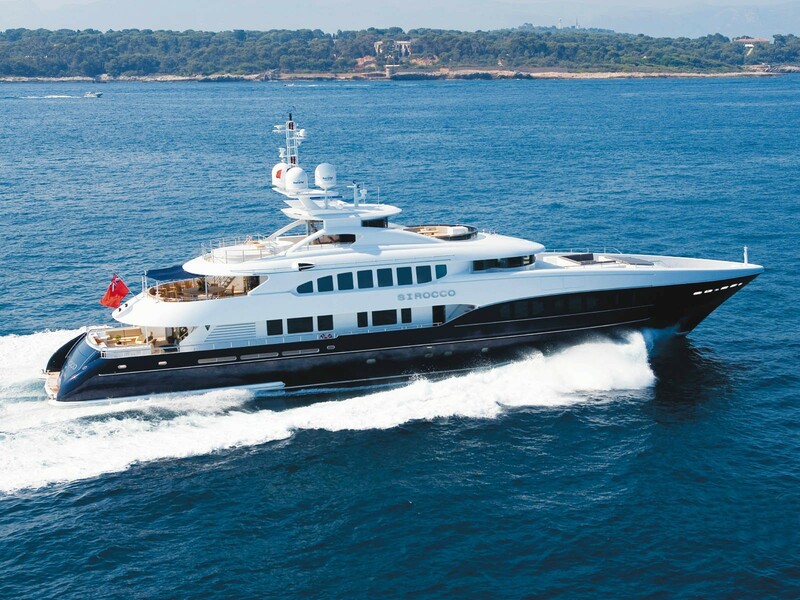 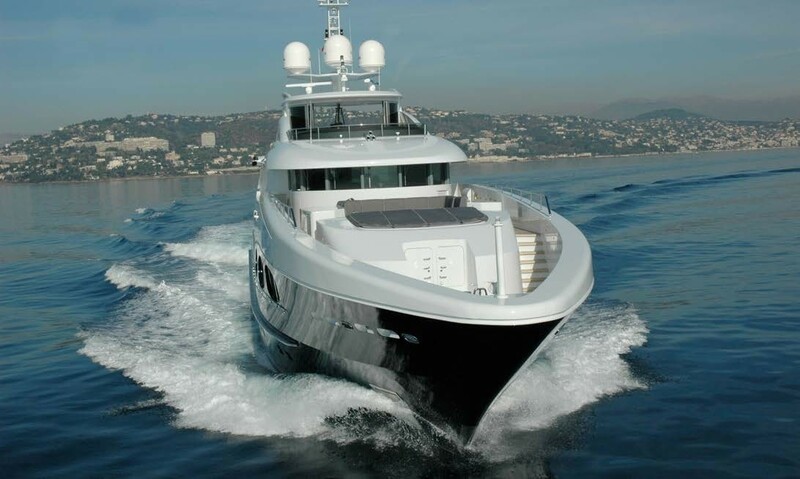 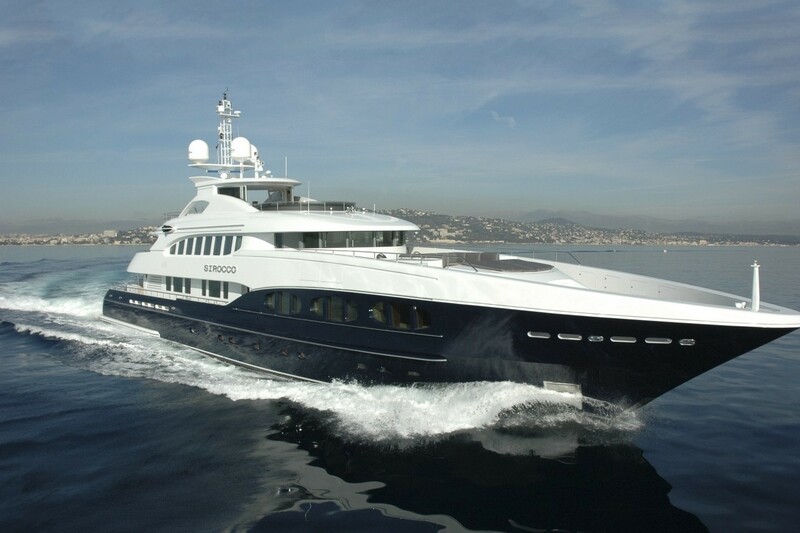 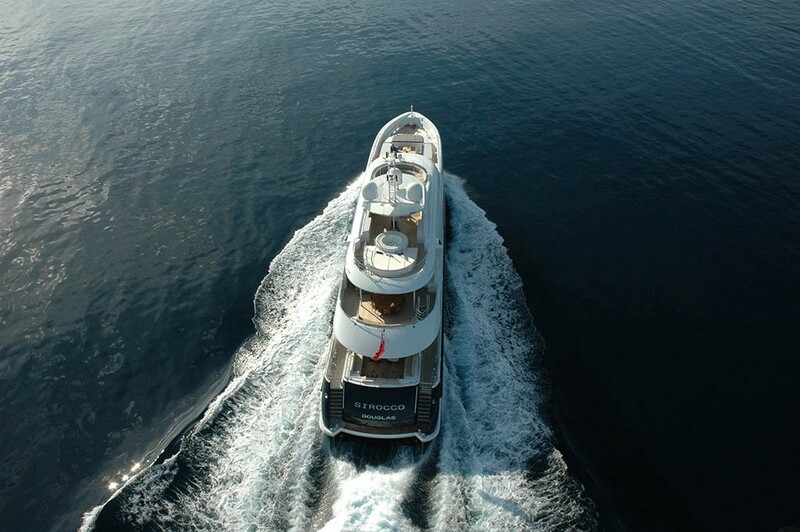 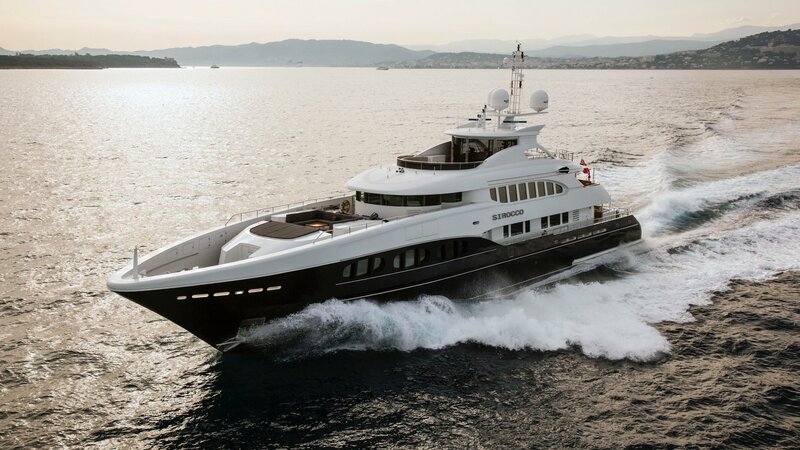 She boasts zero speed stabilizers for added comfort while at anchor and underway. 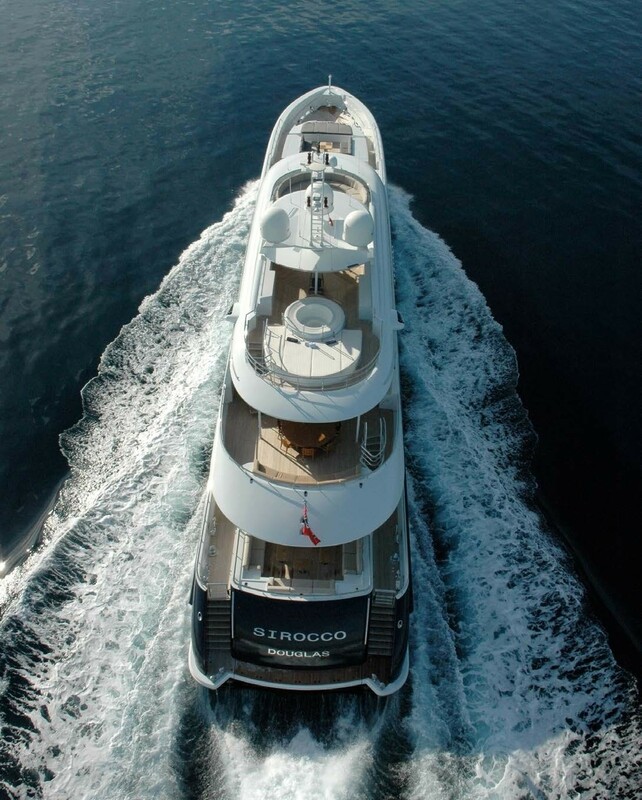 Luxury megayacht SIROCCO offers spacious and inviting accommodation for up to 12 charter guests in 6 well-appointed and superior cabins. 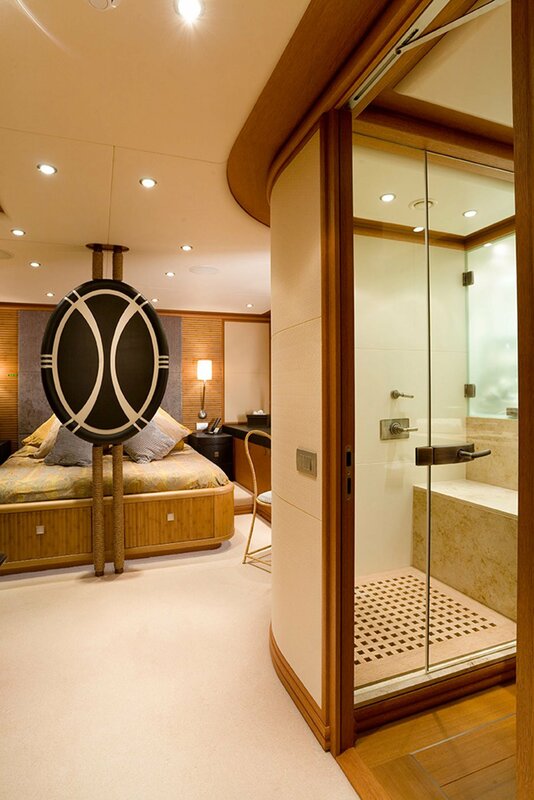 The master stateroom is on the upper deck with 180° views and access to the partially shaded aft deck. 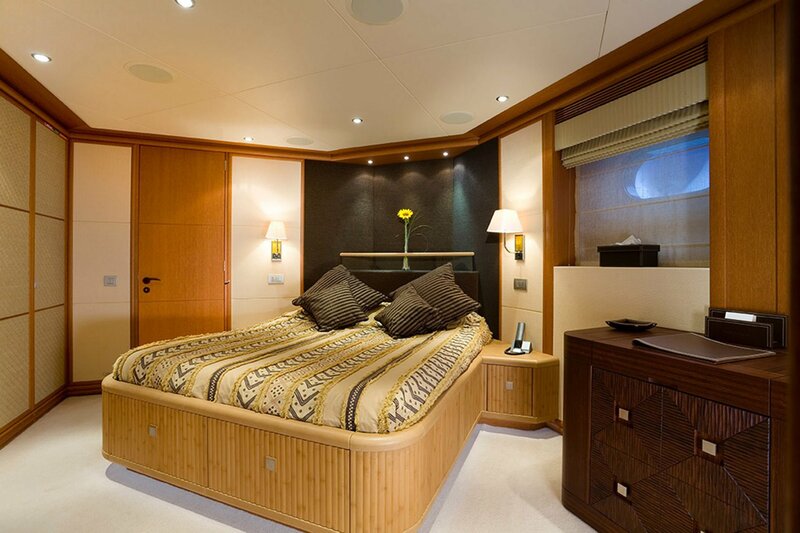 The cabin enjoys a full beam layout, king size bed, leather love seats, vanity, wardrobe and deluxe en-suite with marble tub. 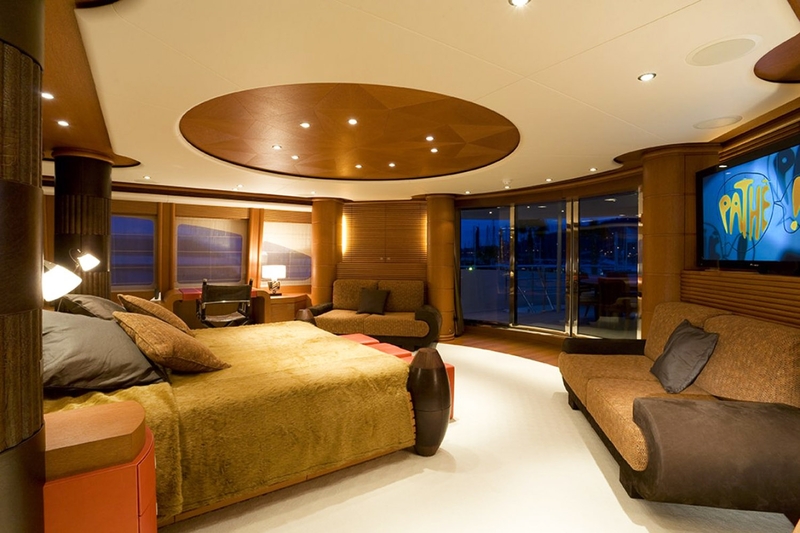 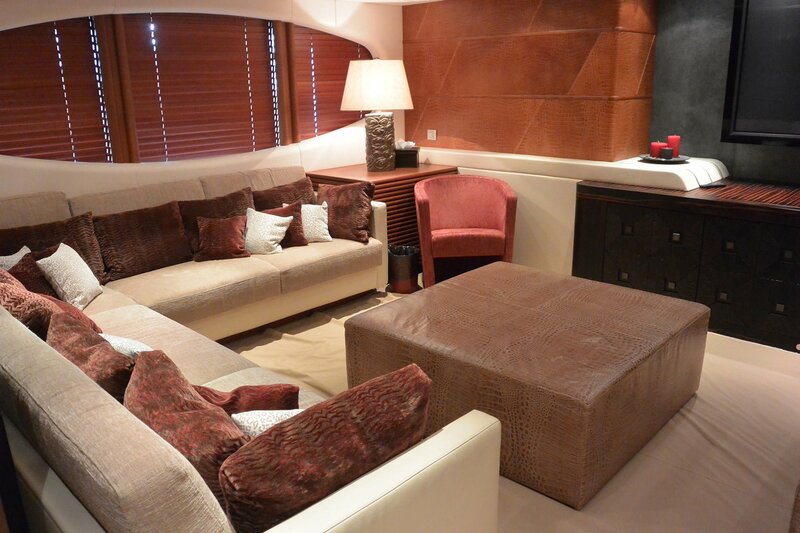 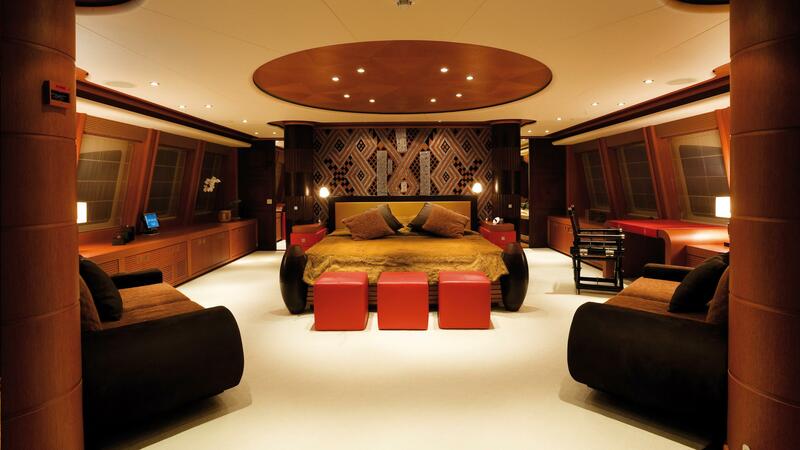 The VIP cabin is on the main deck to starboard with a queen size bed, love seat and en-suite with tub. 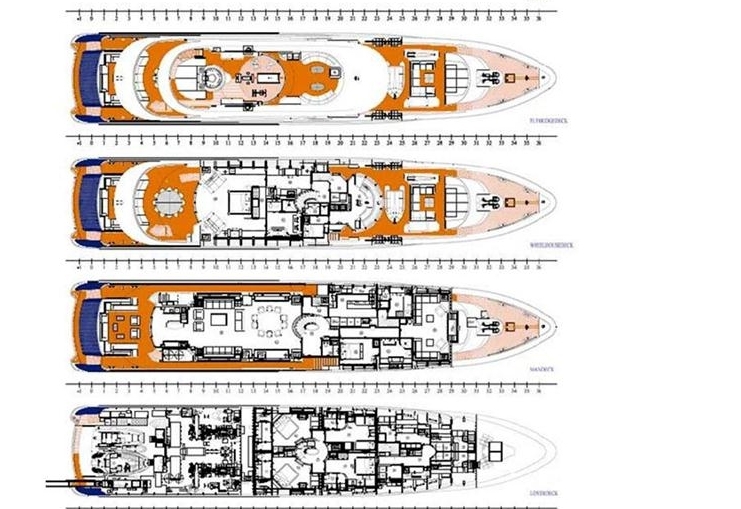 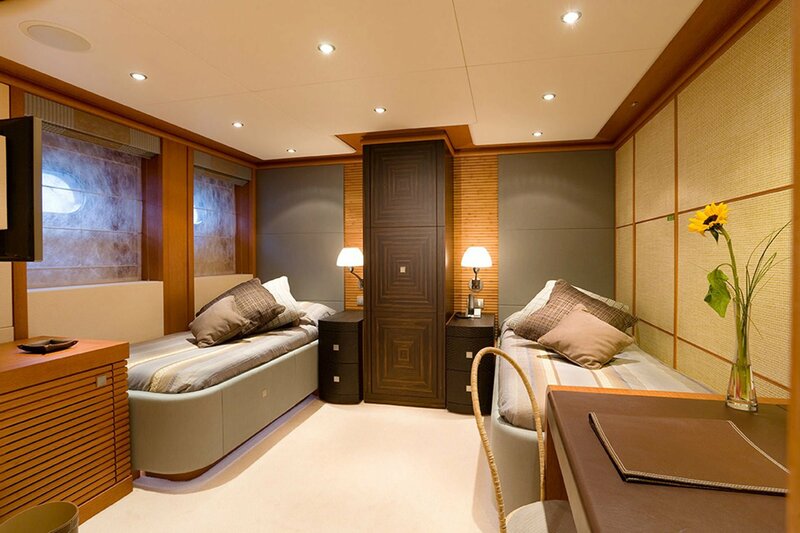 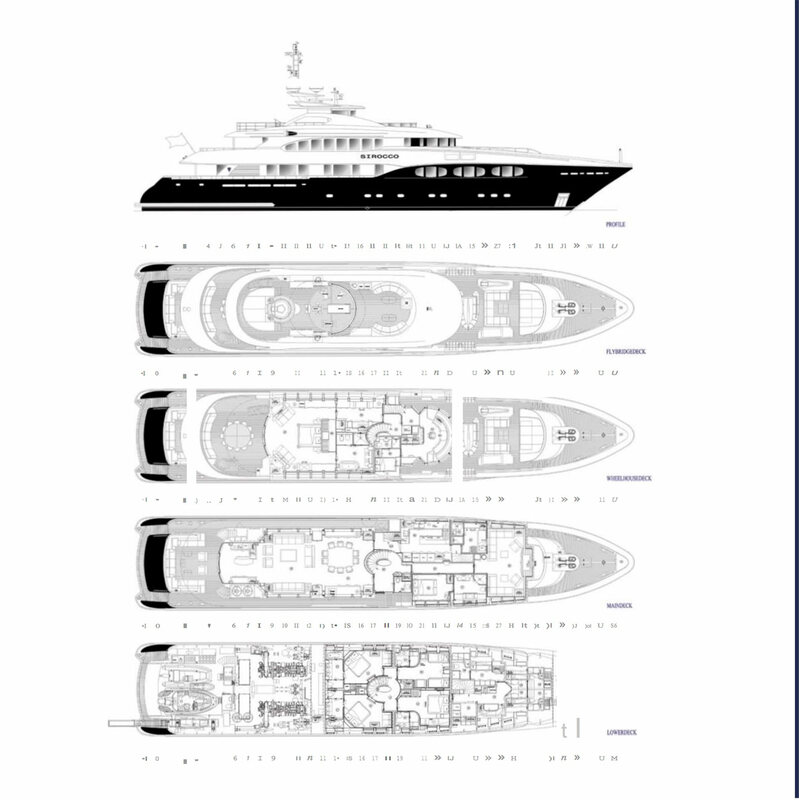 Below decks are 2 double cabins both with queen size beds, love seats and en-suites with tubs. 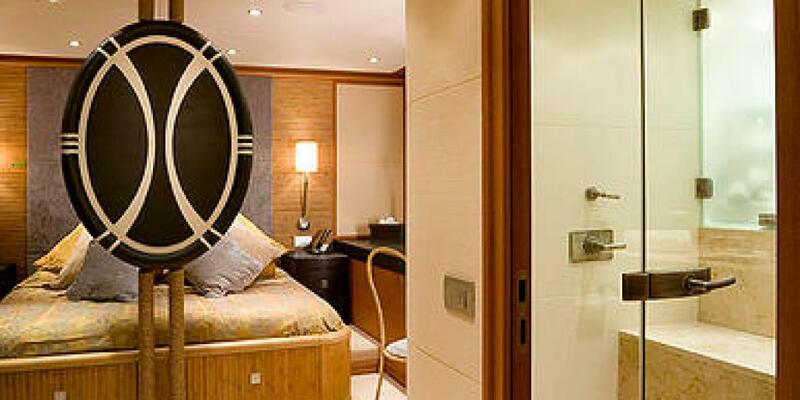 A further 2 guest cabins offer side by side twin beds and en-suites with showers. 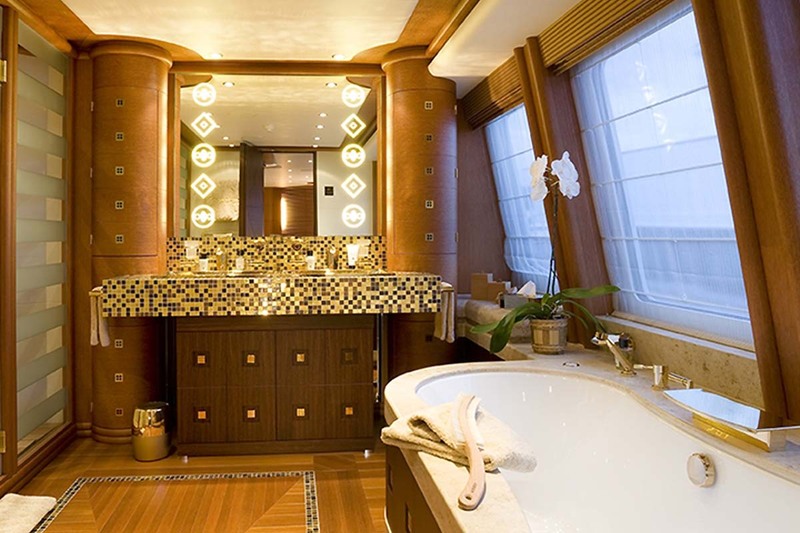 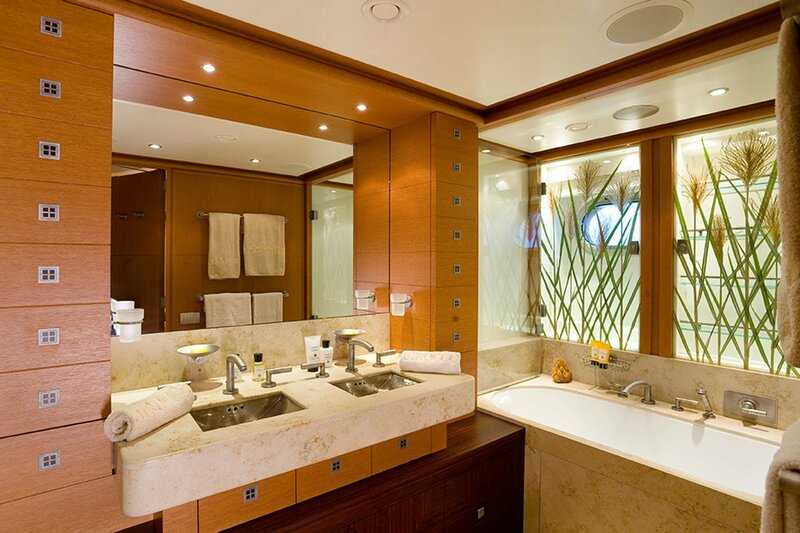 No attention to detail was spared in the intricate and thoughtful design, such touches as gold his and hers sink in the master cabin, and fine leathers and marbles throughout exude elegance and style.